Water won't be able to slow you down while wearing the Essential Details Waterproof Chukka. Featuring a classically styled chukka design, these waterproof men's boots will keep you focused on your day instead of the weather. 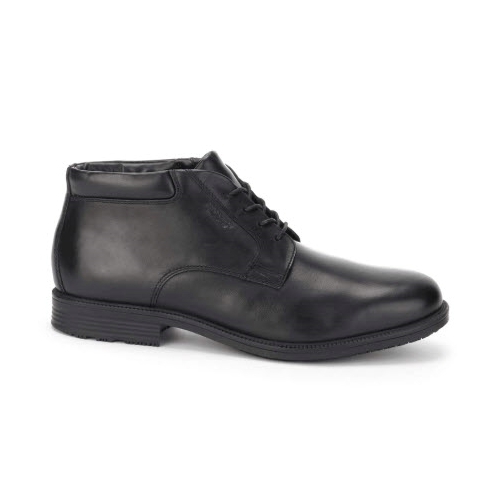 Built with clean leather uppers, this is the perfect men's dress boot to wear in the business world when you need a sturdy, hearty style. In addition, Rockports Hydro-Shield construction offers waterproof leather, a seam sealed, waterproof insole, and a gusseted tongue to help keep feet dry while truTECH sport technology helps absorb shock and cushions your foot so you can be on the move all day long. Hydro-Shield construction offers waterproof leather, a seam sealed, waterproof insole, and a gusseted tongue to help keep feet dry. Waterproof leathers help keep feet dry and are easy to clean and maintain to extend product life. Rubber outsole helps provide durable shock absorbency to help reduce foot and leg fatigue and helps offer traction. Non-Slip rubber sole is ideal for commercial work environments. Rockport's truTECH technology is a lightweight comfort system that provides shock absorption at the heel.